Phishing, or any attack against the user and identity, is scary because if an attack is successful and compromises an identity, it isn’t just a matter of hacking any more – it’s basically logging in. Or think of it this way: How are your outsourced or cloud or internet-facing services looking if bad guys have a good guy’s identity? End-user security awareness lost in the first round. I’m shocked! This is especially surprising because phishing, another attack on the user, won the whole thing. Does this imply that the participants believe phishing can be best addressed with technical solutions? I thought end-user security awareness would be a bit higher because educated users can help reduce the downstream risk of a few areas: BYOD and password practices, as well as phishing. Also, inadequate security budget lost in the first round to insider threats. I didn’t see this coming, as I would have assumed this would be a long-shot favorite. How’s your bracket? 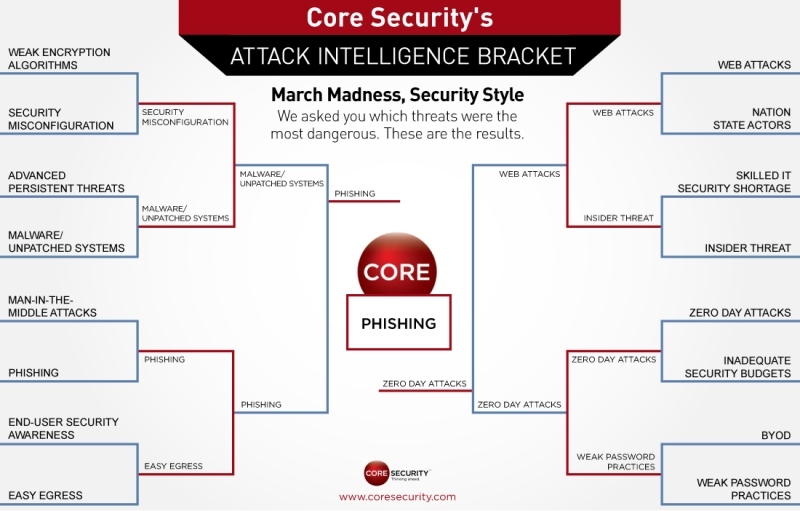 Core Security’s own seeding of the threats is below. We had three of the Final Four correct, but had security misconfiguration beating malware/unpatched systems to take it all. So what do you think? Did the community get it right?